Yesterday when Dave and I were out shooting the Amtrak diversion we were in shirtsleeves and the temperature was up around 60 with sunny skies. Now less than 24 hours later on Saturday the skies are grey and the thermometer is hovering around freezing. I went to the gym this morning and then ran a few errands. When I was done I spotted a green signal at the west end of Davidson Yard that I guessed was up for the ZAILC Atlanta to Los Angeles “Laser” intermodal train. I decided to catch it at the horse farm crossing in spite of the fact I just had a coat on over my workout clothes. 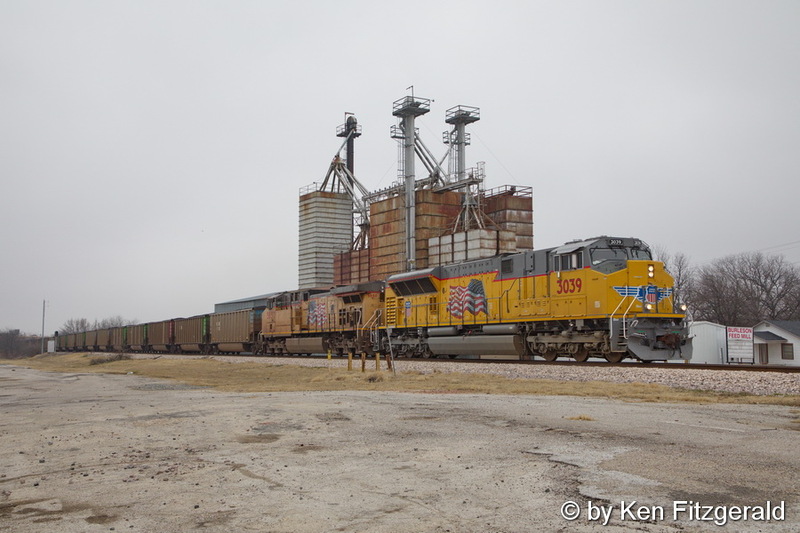 While I was waiting I heard the UP Terminal Dispatcher talk to the UP 3039 South, a new Tier 4 SD70AH about changing crews. I knew what I was about to catch would probably not be as good as the new clean unit, but hey, you can’t catch them all! Then the terminal dispatcher called the ZAILC and told him someone had spotted a defect on a passing car and to stop in Bypass One for an inspection. The carmen arrived quickly and determined the car would have to be set out. This would take a while so I drove back to the yard and saw the lead unit was the old and dirty UP 6505. Well, time to head home. But next I heard the dispatcher talk to the UP 3039 South and ask him if they were going down the Midlothian Sub or the Fort Worth Sub. The answer was the Fort Worth Sub and the train was told they would have to meet a northbound before leaving. I started to think that since I had waited this long I should not go home with a blank memory card. I hit I20 East and then I35 South to Burleson so as to be sure I was ahead of the target train. I set up at the same spot just north of Renfro Street where I took the going away shot of Amtrak 22 on Wednesday in much nicer weather. Less than ten minutes later at 1:46 pm I captured what turned out to be a loaded coal train later identified as a CNRRE9-07 with its nice and clean leader. I worked in the Burleson Feed Mill sign to give it a presence. The going away shot of the DPU’s was also the reverse of my shots from Wednesday. 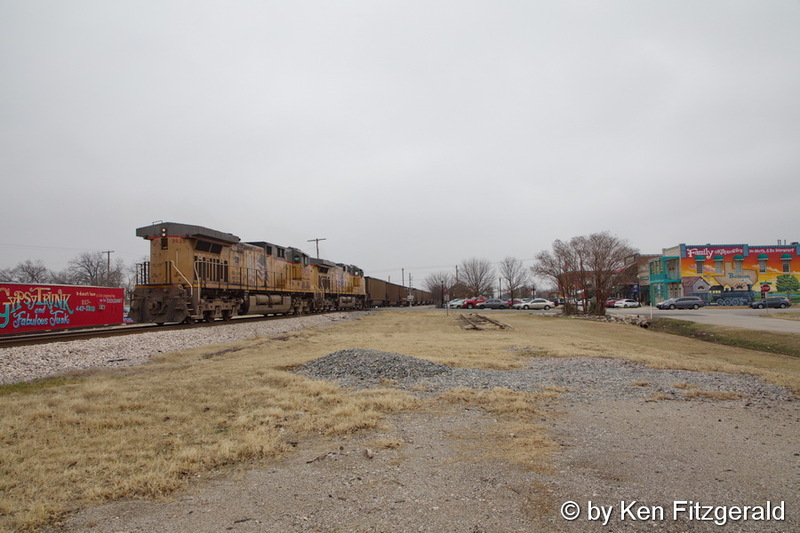 I headed west on FM 1187, and as I came through Crowley I heard a horn and looked ahead towards the BNSF overpass. I could see an intermodal train with J.B. Hunt containers sitting still as a string or northbound merchandise cars streamed by. I guessed I was looking at the southbound Z-ALTROB out of Alliance Yard going to Mexico via the KCS at Robstown. I immediately headed south and pulled over at a recently closed crossing about a mile south of the siding. 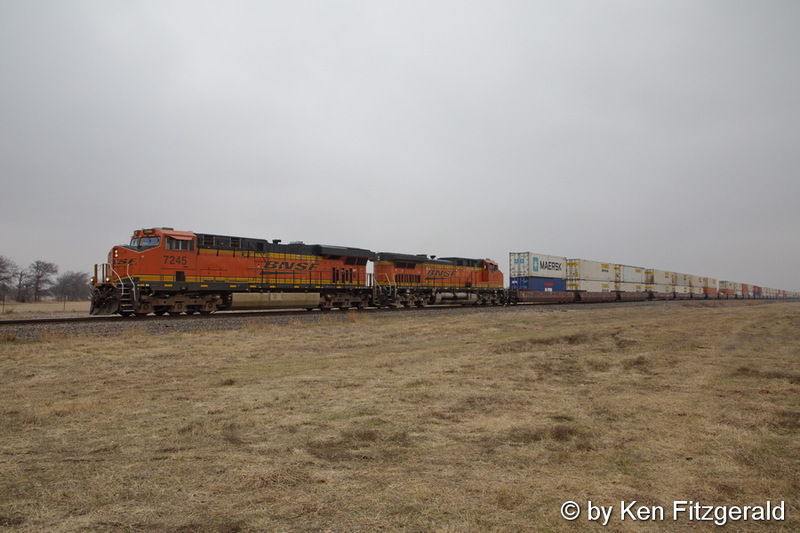 I could see the headlight already catching up to me and in a minute I took this photo of the BNSF 7245 South at 2:04 pm with trailing containers and auto racks bound for Mexico. 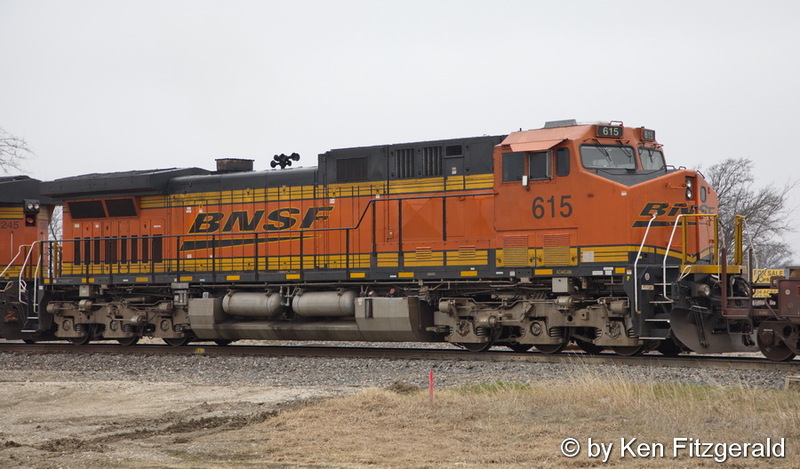 The lead unit was an ES44DC and the trailing unit was one of the unique rebuilds of a ex-Santa Fe C44-9W into an AC44C4M as the BNSF number 615. Hard to tell for sure without hearing it but that looks to me like a Nathan P5 horn up there instead of a “K” model. Not the greatest weather to be out in, but I cannot complain about turning one missed train into two better opportunities! I agree Ken, going home with nothing to show for it is totally unacceptable. You obviously came home with something worth presenting. Good work. Even on the worst of days there has to be a view /angle / subject that is unphotographable on sunny days. Lemonade. funny, the one thing that struck me with your post was…You went to the gym? Everything else was expected.